Zulu is a handsome black lab. He is a very big boy weighing in a 115 pounds, and not overweight. 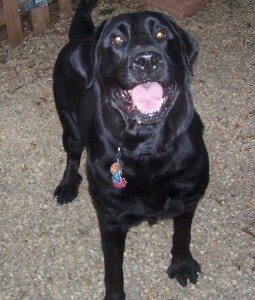 Zulu may have a little Newfoundland in him, or he may just be the English Labrador style of the lab breed. He is a great dog and is now looking for a new home because his owner lost his job and home. If you or someone you know is looking for a older boy, who is housebroken and an all around great dog take a look at Zulu.